The discovery of extremely contaminated ice in five of the UK’s leading pub chains by the BBC’s Watchdog programme once again highlights the vital importance of regular cleaning and maintenance for ice makers, says David Rees, marketing manager of HTG Trading, owners of Hubbard Systems which distributes Scotsman Ice machines in the UK. The show took samples of ice and water from ten branches each of the five chains, with tests revealing faecal bacteria at levels “too high to count” in all of them. There are numerous factors that could result in ice being contaminated. One of the easier things to overlook is mishandling by front of house staff. While chefs and food handlers are usually aware of the importance of cleaning their hands before touching food, basic hygiene training is sometimes overlooked for front of house staff, or forgotten about in the daily bustle of work. Ice should never be handled with bare hands. Only tools like tongs or scoops should be used, and those tools should be cleaned and sanitised at least once a day to stop contamination from getting out of hand. While human contact is the largest vector for bacterial transmission, it can also fall on it directly from the air. 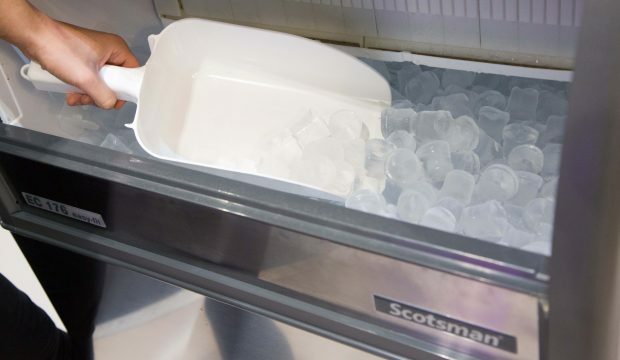 Ice containers should have lids in order to minimise those risks. The importance of keeping your ice machine clean, too, cannot be overestimated. Putting in place a regular cleaning and maintenance schedule should protect against contamination, and done correctly will not add much onto your staff’s existing workload. This schedule needs to be broken down into three different stages: Daily tasks, monthly tasks and those that need doing every six months. The daily cleaning tasks include sanitising any scoops or tools used for removing ice from the bin. These tools should not be stored in the bin. Next, wiping the external surfaces of the ice bin with food-safe sanitiser, with particular attention paid to the areas touched in the process of opening the bin. Finally, a visual inspection to ensure no contaminants have entered the storage bin. If there is anything present, the ice needs to be discarded and the bin fully cleaned. The monthly tasks include a full and deep clean of the machine according to manufacturer’s instructions. This involves switching it off and emptying it completely first. Air filters should also be removed and cleaned at this time. Every six months, replace the water filter cartridges. This will help prevent limescale from building up, guaranteeing crystal clear cubes as well as preventing bacteria from the incoming water supply. Of course, your cleaning procedures can be comprehensive on paper, but if your staff are not trained properly and made fully aware of the risks of serving contaminated ice to customers it’s totally irrelevant. Making sure they understand the importance of keeping your ice machine clean is an important step in the process of ensuring that these kind of stories stop occurring. The site also has a series of videos demonstrating exactly how to clean various ice machines.